A series of Sepak Takraw 'Kits' and 'Sets' that include equipment and instructional materials ... ideal for school P.E. programs, and all at a 10 - 25 % discount! From the Sepak Takraw Resource Package to the Starter Kit or Indoor Starter Kit Deluxe to the Outdoor Sepak Takraw Game Set, the perfect combination of equipment and materials to meet any school's program needs or budget is available. These Kits and Sets are also just what any school would need to 'develop' the sport of Sepak Takraw in their community ... and we believe this is the perfect time to introduce and develop a new, very inexpensive kicking sport that uses the major equipment that schools' P.E. facilities will already have (badminton poles/nets/courts). And with a minimum of only 3 players on a team, it is also not difficult to field Sepak Takraw teams. So go for it! Isn't it time your school got its kicks? The rules of the sport of Sepak Takraw require both male and female players to wear shorts and jerseys or t-shirts. Most players tuck-in their shirts to reduce the chance of causing a net fault. The jerseys or T-shirts for all players must also be numbered at the back, in which numbers are only ranged from 1 to 15. The captain of each regu (team of 3 or 4 players) is required to wear an armband on their left arm. Any apparel that could endanger opponents is not allowed. Ideal footwear is that which has flat sides and sole (providing optimum control when kicking the ball with from the inside & outside sides of the foot or from the a sole), has some kind of protective reinforcement built into the sides and top of the shoe, has good grip on indoor and outdoor surfaces, has an overall light-weight and most important, has a very supportive insole for cushioning the high impact of constant jumping and landing (important for injury prevention). Until now, it was impossible to get all these features in ONE shoe, but just recently a new line of very versitile, athletic shoes, NETPRO's NP KICKERS, has been released that does have ALL of these features in one shoe. IF YOU'RE A KICKER, YOU GOTTA GET A PAIR OF THESE SHOES! To view or purchase the perfect "kicking shoes" quickly and easily online, click here. and in case the Takraw ball hits the ankle instead of the foot (or shoe) in the course of play. For the forward players who do a lot of jumping, Knee Tensors are frequently used for injury prevention – keeping joints, tendons and cartilage warm and snug while protecting the surface area from possible falls as well. Those who are the primary spikers may also wear some type of wrist support since after jumping up, flipping in the air and executing a spike they often land on their feet and hands. 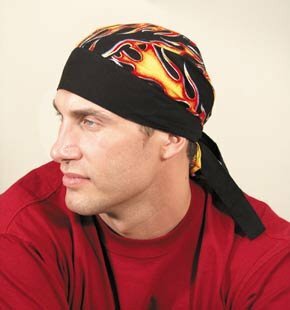 Some players also like to wear a bandana on the head to keep sweat from running in the eyes while playing and to soften the impact of the ball on the forehead. The Sepak Takraw court is standard in size and is about equal to a doubles badminton court, 13.4 m X 6.1 m (20 ft. X 44 ft.), which makes Takraw very easy to introduce into schools as a new sport. Takraw may be played indoors or outdoors, although most major regional or world championship tournaments are played in indoor stadiums on rubber type of court mats that are available in Asia at Gajah Emas®, Malaysia. The playing surface must be flat, horizontal and uniform. The width of the lines bounding the court should be .04 m (1 1/2; inches) measured and drawn inward from the outer edge of the court measurements. Court boarders should be at least 3 m (about 10 feet) away from all obstacles. Centre Line: The centre line of .02 m (1 inch) should be drawn equally dividing the right and left court. Quarter Circles: At the corner of each centre line, a quarter circle shall be drawn from the side boundary line to the centre line with a radius of .9 m (3 ft.) measured and drawn from the outer edge of the .9 m (3 ft.) radius and side boundary line. The Service Circle: The service circle of .3 m (1 ft.) radius shall be drawn on each half of the court, the centre of which is 2.45 m (8 ft.) in from the baseline of the court and 3.05 m (10 ft.) in from the sidelines. The service circle is measured and drawn from the centre to the outward edge of the .3 m (1 ft.) radius. Height of the Net: 1.52 m (5 ft.) at the centre and 1.55 m (5ft. 1 inch) at the posts for men; 1.42 m (4 ft. 8 inches) at the centre and 1.45 m (4 ft. 9 inches) at the posts for women. Many schools simply use their badminton nets for Takraw (but of course they will eventually wear out faster). Height of the Posts: ISTAF regulations call for the posts to be1.55 m (5 ft. 1 inch), but any badminton or volleyball posts may easily be used as long as the net is secured to the desired height. Free Area: An area of 3m (or 10 feet) outside the court boundaries should be free of obstacles. 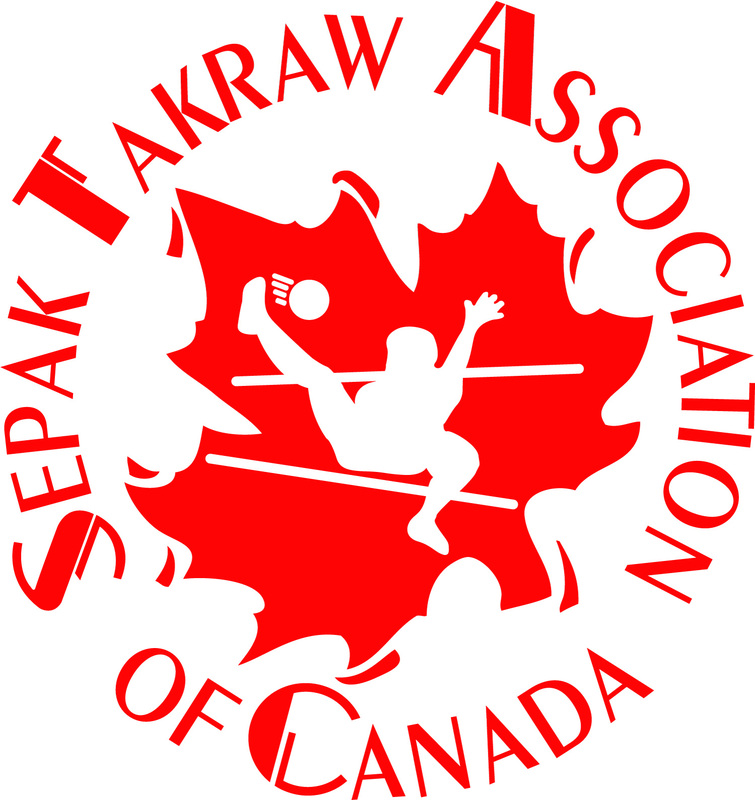 Please Note: Commencing February 16, 2002, rules regarding scoring for Sepak Takraw have been changed to a rally point scoring system. 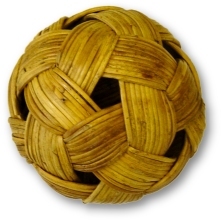 Throughout various S. E. Asian countries, original Takraw balls were made up of hand-woven strips of rattan ... a material that once grew in abundance there. The ball was commonly up to about 5" in diameter, and villagers would enjoy standing in a circle kicking the ball around to each other much the same way footbags are played with today. As far as historians can figure, the rattan ball in S. E. Asia dates back some 500 years. However, due to a drastic depletion of rattan supply over the years, stricter regulations have been enforced regarding its extraction from the jungle. Besides this, the rattan takraw ball was found to break apart and splinter fairly quickly with the introduction of hard spike kicks when the net game developed. This led to the making of synthetic balls, still hand-woven and still designed the same as their rattan predecessors. STAC has tried and tested various synthetic brands of Takraw balls, including Buka, Marathon, Rambo, Gajah Emas and NETPRO®, made by Gajah Emas. The challenge was to have a series of balls that would be reasonably priced, appealing, safe, durable and appropriate for players that vary greatly in age and level of experience. After many trials, tests and much consideration, STAC approved a series of NETPRO® Synthetic Takraw Balls for official use in Canada. NETPRO® offers FIVE levels of high quality, attractively coloured, durable balls for five levels of play, each producing a superb bounce ... manufactured by Gajah Emas®, Malaysia. The NETPRO® series starts with the Beginner Ball, which is very light weight and the synthetic strips are loosely woven and made up of a thinner, softer material (providing more give on contact when kicking or heading the ball). Though the beginner ball has been used by all ages, even kindergarten, it is probably most suitable for about grade 5 or 6 and up (which is also a common age at which most schools seem to introduce Sepak Takraw in Canada). Each higher level ball, ending with the Pro Ball for the men's division, is a little heavier than the previous one (providing more control) and the synthetic strips are a bit thicker, harder and woven together more tightly - providing less give on contact but more bounce (faster game), all aspects of which the more experienced players enjoy. To purchase any of the NETPRO® series of Takraw balls online, click here. Although even badminton nets can easily double as takraw nets, a standard Takraw Net is heavier and stronger, with the netting weave also being courser than a badminton net but finer than a volleyball net. Since the ball can be played off the net in Sepak Takraw, a standard net that is attached tightly will also provide a nice rebound when the ball hits it, and this is usually not the case with most badminton nets. STAC has approved a couple of Takraw nets from Gajah Emas for official tournament use and for outdoor recreational use in Canada. Excellent for the outdoors is the Complete Sepak Takraw Game Set, which consists of: a net, PVC or Aluminium telescoping poles, pre-measured court line with attached corner pegs, anchoring ropes & pegs to hold the poles up, 3 takraw balls, the Takraw 101 Complete Instructional/Coaching Manual, the Official Rule Book and an Instructional Takraw Video that all comes in a slick carrying bag. It's all very light weight, portable, and can be set up in less than 5 minutes! 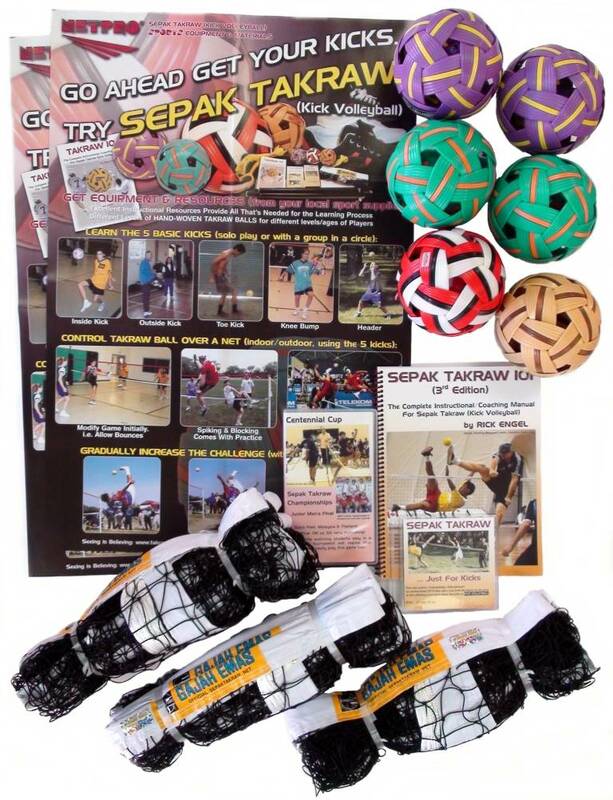 The complete Sepak Takraw Games Set is great for summer camps, parks, YMCA's and other recreation centres and outdoor intramural programs in schools and universities. To purchase Takraw Nets or Complete Game Sets quickly and easily online, click here.